Students at Colorado State University care for plants in a greenhouse on campus in Fort Collins, Colo. The American agriculture industry has a problem though; there are not enough grads to fill those jobs. The report projects about two open jobs for every qualified graduate. That’s left the USDA, land grant universities and private industry scrambling to try and bridge the gap. When Colorado State University student Aubriel Jones tells her friends she’s studying agriculture, she sometimes gets puzzled looks. Colorado State University senior Aubriel Jones says she's already being recruited for jobs by large agribusinesses. “They say, ‘Oh you’re learning about corn right? Or you’re learning about how cows eat?’ Things like that,” Jones says. But it’s way more than that. Ask what she’s actually studying, and it’s a mouthful. With agricultural degrees in such high demand, that combination likely sets Jones up for a pretty easy job hunt when she graduates. 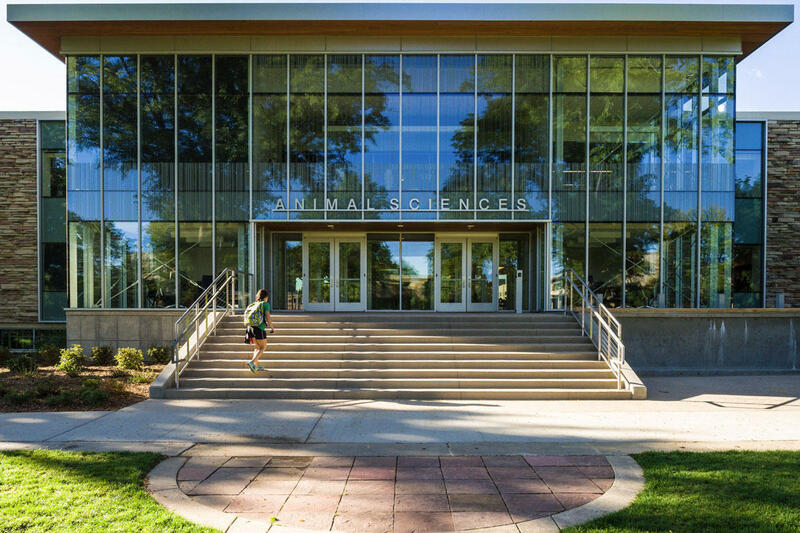 The animal science building at CSU recently underwent a multi-million dollar renovation, which department head Kevin Pond says was partly meant to show prospective students that agriculture is a modern field of study. CSU is Colorado’s land grant university, institutions originally established in the 1800s to teach agriculture, science and engineering to eager students. Kevin Pond, head of CSU’s department of animal science, says while enrollment in his department is steadily rising, the vast number of vacant jobs in agricultural and food sectors is partly due to perception. Young people don’t think of it as a growing field, or an area with sunny job prospects, even though it’s common for animal science graduates to come out with multiple job offers. Students, even at this land grant university, are increasingly urban. Most don’t come from a farm background. “The truth is, in animal science, it’s 80 percent female, it’s 90 percent urban and our new minority is a white male from a rural background. Crazy to think,” Pond says. "It's no longer menial labor that's at a low salary. Their salaries are going up and up and up because of the scarcity." The stereotype of the farmer in manure-covered overalls driving an old tractor still exists, Pond says. Helping prospective students see ag as a modern, potentially lucrative field of study is part of the school’s sales pitch. Job openings are highly-skilled and a lot of times they’re at Fortune 500 companies in marketing, food safety, plant science and veterinary medicine. Agriculture programs at land grant universities are focusing on science in a bid to stay relevant, even as it takes fewer people to run farms and ranches. "Our new minority is a white male from a rural background." “If you have 1 percent of your population feeding the other 99 percent, if we’re relying on that pool to fill our classrooms we’re going to be a dying college, ” Pond says. Some of the onus should be placed on private industry, says Krysta Harden, deputy secretary at the U.S. Department of Agriculture. Food and agribusiness companies need to do a better job wooing students and working with public universities. Part of the problem in filling these jobs is location, Harden says. Many recent college grads look to major cities for their first jobs, not the rural Midwest. U.S. Department of Agriculture Deputy Secretary Krysta Harden says private companies need to do a better job recruiting recent college graduates. It gets even harder when you’re attempting to build a diverse company in rural America. Colorado State University senior Aubriel Jones is already being recruited. But her passions are in local food and organic agriculture. So when food giants like Tyson or ConAgra come knocking, she’s less likely to hear their pitch. “Honestly I feel like the businesses and industries that have come to me are ones that I’m not particularly interested in. They’re mostly the large ag industries,” Jones says. That mismatch in values, where big equals bad to the millennial ag job seeker, is part of what’s leaving large food companies with vacant jobs. Even as food remains a hot topic and cultural flashpoint. Those same friends who think all she does is study corn? Over the years at CSU, they’ve come around. “The thing I’ve really noticed about my friends over the past couple of years is that they’re becoming way more interested in the food that they’re eating than they were at the beginning,” Jones says. It’ll take a lot more of those friends turning a casual interest in food into a degree in agricultural science to eventually fill the gap. A highly anticipated batch of federal laws governing the use of drones could change the regulatory landscape and lead to an explosion in drone use by farmers. Farmers see drones as a way to get a birds-eye view of their fields to find problem patches with crops. That information can allow farmers to be more precise with fertilizers and pesticides and, ultimately, save them money. But getting them in the sky without running afoul of federal regulation is proving to be a challenge. Commercial use of drones is still widely banned in the U.S., though some companies have secured exemptions. Other farmers have gone rogue, flying drones over their property without all the proper permissions, daring federal regulators to put a stop to it. But the new federal rules due out later this year are expected to usher in a new era of farm machinery. Boulder and Denver have become hubs for tech start-ups, and the northern Colorado region is dotted with widely respected scientific research institutions. But a new report [.pdf] from Colorado State University takes the idea a bit further, with an agrarian twist. Food companies the world over are paying close attention to the groundswell of support for food transparency, the “know where your food comes from” movement. JBS, the largest meat producer in the world, is beginning to take notice as well. But executives with JBS USA, the North American arm of its Brazilian parent company, at the same time acknowledge that the very nature of their business is grisly, gory and sometimes unpalatable. The blue corduroy jacket worn by high school students in FFA, formerly the Future Farmers of America, is an icon of rural life. To the average city dweller the jacket is a vestige of dwindling, isolated farm culture, as fewer and fewer young people grow up on farms. The numbers tell a different story. In spite of that demographic shift, a record number of kids are donning blue jackets.